Record rainfalls in Australia during 2010-11 briefly halted the yearly sea level rise brought on by global warming. Whether you believe in global warming or not, it is an indisputable fact that the sea level is rising by around 10 millimeters (0.4 inches) per year. Except for 2010, that is, when they dropped by 7 mm (0.3 inches) instead. So what force was mighty enough to halt the steady rise of our sea? The land down under: Australia. Australia's vast, inland deserts are very flat and very dry, so when it rains there, rather than rolling down hills and mountains into the ocean like pretty much everywhere else in the world, the continent simply soaks up the water like a big Australia-shaped sponge. Anyone who's been through High School science and learned about the water cycle should know that the amount of water in the world is a constant, so when an inordinate amount of rain fell on Australia during an 18 month period from early 2010, it ended up sucking up a lot of water that would have otherwise fell in places that would have funneled it out to sea. 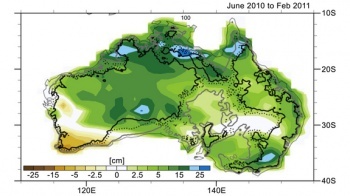 The heavy rainfall and flooding in Australia resulted from the confluence of three climate patterns in three ocean basins. First, a La NiÃ±a in the eastern Pacific Ocean meant cooler surface waters, which shifted tropical rainfall over Southern Hemisphere continents. The La NiÃ±a combined with unusual atmospheric patterns over the Indian and Southern oceans to cause record rainfall in Australia, the National Center for Atmospheric Research (NCAR) researchers said in a statement. So there you have it. Australia's deserts are so vast and menacing, that they even caused the sea to stop rising. Can you believe people actually live there?